Shellfish allergens, including crustaceans, are among the eight most common allergens in the U.S.
Shellfish allergens are one of the most common food allergens in the world, and the most common food allergen in the United States among adults. Shellfish allergies usually start in early adulthood, though they can appear at any time in life. Shellfish allergies typically never diminish over time. Shellfish, and other land animals such as cockroaches and snails, contain a protein called tropomyosin. Tropomyosin produces a large amount of histamine in allergy sufferers. This reaction is what causes some of the symptoms of an allergic reaction such as swelling of the mouth and face. In addition, it also causes anaphylaxis, which if not treated immediately, can be fatal. Other symptoms may include vomiting and other gastrointestinal discomfort, tingling of the mouth and lips, rash development, profuse sweating, and red, irritable, itchy eyes. The more serious of such described symptoms usually comes from crustaceans, one of the two categories of shellfish. 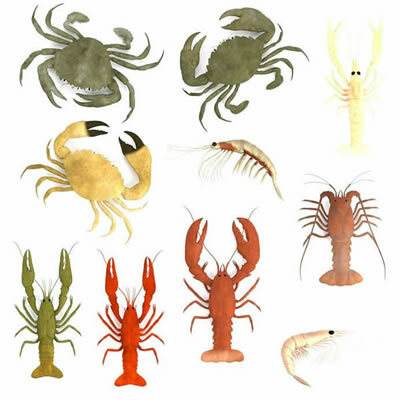 Crustaceans include shrimp, crab, lobster, and crawfish. Crustacean allergens are considered part of “The big 8,” meaning they are among the eight most common allergens in the United States. Thus, packaged products containing shellfish are strictly controlled. Any product containing crustaceans must be clearly labeled for consumers. The second category of shellfish is mollusks. Mollusks include clams, mussels, oysters, scallops, octopus, squid, and snail. Reactions to mollusks are usually less pronounced, but can still be severe. For some individuals it is possible to be allergic to solely crustaceans or only mollusks, though it is typically recommended that people stay away from both without specific allergy testing. However, surprisingly enough people with shellfish allergies can still eat finned fish. To prevent adverse symptoms, people affected with shellfish allergies are recommended to refrain from consuming any amount of shellfish including avoiding restaurants that have a high risk of cross-contamination, such as seafood restaurants. In particular, East Asian dishes and sauces, more often than not, contain some amount of shellfish. While unusual, an allergic reaction to shellfish from the vapors it releases while being cooked is possible. Any food labeled as having shellfish is unsafe. Additionally, fish stock, seafood flavoring, surimi, bouillabaisse, some calcium supplements, and fish oil all contain some amount of shellfish. If a consumer with shellfish allergens is unsure about a product, the individual should make a priority to contact the manufacturer to ensure the product is safe for consumption.